Matt Lubich, the editor of the Johnstown Breeze, offered up those wise words when I was just a junior in high school beginning my writing career as a reporter for our small town, weekly newspaper. There’s never been a time when that tip hasn’t worked when meeting with someone for a story. It often leads to the story writing itself. Journalism has never paid much. I didn’t go into this career with money in mind. But the other benefits are priceless. That includes getting to meet interesting people and listening to their stories. An example is Marilyn Cain and her Ukrainian style of decorating eggs (see the story on page 4). What I thought might be a 15-minute interview turned into much more. It was hard for me to leave her house, hearing the story of how she took years to recover from a car crash and couldn’t do what she loved most for nine years. The interview went way over an hour. This is the part of journalism I’ve always enjoyed – the people and their stories. I’ve never been much of a “hard news” kind of guy. I’ve always enjoyed covering sports and writing features. Working here at Life After 50 is even more enjoyable because I get to profile seniors each month. There are tons of great stories to tell, and I can’t wait to listen. If you have an interesting story or background, feel free to email me at anthony@lafifty.com. 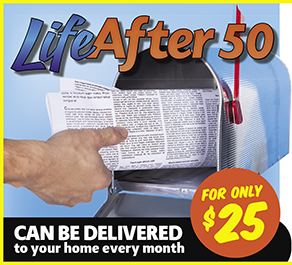 Thank you for reading Life After 50.